For the past 40 years, Listenow has been active in bulk loading systems. It is a firm believer in innovation, the longevity of its products and its expertise in solving even the most challenging problems. All components leaving the company’s plants are checked to the last detail. This enables it to set the foundations for outstanding quality and to operate as a trusted partner with a fully committed and responsible approach to every project. Listenow equipment handles the full range of free-flowing bulk commodities, from A for ash to Z for zinc. Its wide range of loading systems are suitable for all loading activities, whether materials are being loaded onto railwagons or silo trucks. Client industries include port operators, aluminium and glass production, cement factories, coal-fired power stations, animal feed processing, mining, synthetic granulate manufacturing and storage silo systems. Dust-free loading of bulk materials of all kinds for any means of storage or transport. Products are always supplied as complete, fully compatible units and their robust and efficient construction allows throughput of up to 1,000tph (tonnes per hour) depending on material type at temperatures of between –40°C to +120°C, and up to +600°C in special cases. Listenow offers electronic, electromechanical, and pneumatic measurement of fill levels. Its product portfolio is supplemented by a large range of special-purpose equipment, such as vibration devices, spreader plates, electrical winches, protective rubber buffers, highly wear-resistant conical sections and tubes, as well as galvanized metal parts and chrome-nickel steel sheet metal components. Loading equipment is supplied as complete units fitting the mount points and existing discharges of silos, as well as worm screws, wheels and other attachments. The diameter of the loading hose will depend on the type of bulk material and the desired loading rate. Loading System 4050: double-loading system with integrated filter connection, 3 external cable guides and locking cone. Interior with flexible tubing, telescopic sections or tubes. hoses for many years. Its loading hoses are supplied in diameters ranging between 200–2,000mm; their length is determined by on-site requirements. Loading Hose Fittings: loading sleeve sets for loading systems with dedusting connectors, with interior sleeves hanging loose or connected with arms, with plates or telescopic sections. The cascade solution for highly efficient loading. The unique design of the individual cascades and their robust and easy-to-use construction promises fault-free and highly efficient filling. In order to prevent the filling material from forming into piles at the bottom of each cascade, the cascades are aligned slightly apart to transfer the material without allowing it to fall freely for any great distance. In addition, the angle of the cascades can also be adjusted to regulate flow speed and prevent separation. FLOW-stop also as a feeding system. This cost-effective unit supports the precise positioning of vehicles at the loading point. A reflection light barrier indicates the exact position under the silo discharge by reflecting light against strips attached to the side of the vehicle.This allows the vehicle to be positioned quickly and accurately. Self-adhesive reflective strips attached to the side of the vehicle allow a laser reflective sensor to indicate the correct position under the silo discharge. The signalling system linked with the laser light barrier allows the driver to position his vehicle precisely to each filling opening. This positioning aid therefore enables safe and efficient refilling of silo vehicles and significantly reduces vehicle waiting times. The safety folding steps for loading systems. Listenow supplies LIS-klap safety folding steps to give operators easy access to vehicles, such as tankers, silo trucks and tank wagons. The folding steps are based on a flexible, robust design to allow personnel to access the vehicles in maximum safety. Anti-slip safety steps, hand rails and a stable support structure ensure accident-free access at the loading point. Listenow supplies folding steps with three, four and five steps. All models are ready to use immediately after installation. optional control of differential pressure. DF 9/2000 reverse air filter: filter area: 9m2, 14m2, 18m2, 24m2 or 30m2 (special sizes up to 56m2). To optimize the return of separated dust, the dedusting rate is generally adjusted so that no surface is inclined at less than 60°. All models have a sturdy, high-performance construction and are tried and tested in many tough everyday applications. All manual winches have a safety load brake and load-carrying capacity of up to 300kg. Listenow’s electrical winches are capable of extremely high performance and have load-carrying capacity of between 220kg and 4,000kg depending on the individual model. 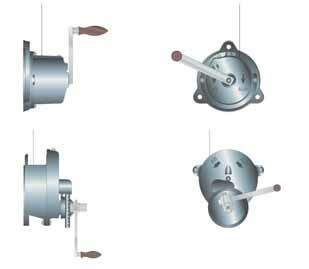 A powerful three-phase motor, up to three pulleys, adjustable lifting limitation, including inductive slack rope switch and emergency manual operation, make these winches into easy-to-operate components for mounting alongside the upper unit of the loading system, or on a wall, ceiling or floor. All electrical winches are also available as explosion-proof models. location of cable output can be adjusted in any direction by simply turning the housing as required. Listenow’s compensators are constructed to client specifications. A variety of coated polyester weaves, aluminium-coated, temperature-resistant kevlar and fibreglass, and its own PU-flex can all be used, complete with FDA Certification if necessary. These products provide pressure-free axial, lateral and angular compensation for pairs of round or right-angled fixed points. No norm exists currently for their design so Listenow’s production is at the cutting-edge of technology. These high-quality and robust compensators are constructed and delivered to individual client specifications.